The history of the Vietnam War, from Vietnam’s struggle for independence to the protracted peace process which bought the conflict with the USA to an end. Contains fascinating details about guerrilla warfare, major offensives, the daily life of a soldier and how public opinion in the USA turned against the war. Illustrated with a combination of photography and comic book style illustrations where appropriate. Includes internet links to educational websites to find out more. Great book. 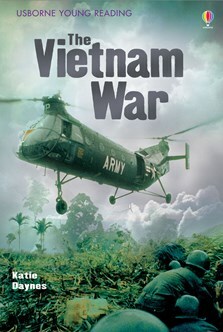 Very interesting to learn about Vietnam in the lead up to the war as well as the American public's view on the conflict. Would have liked more information about North Vietnam's relationship with the USSR and China but overall very informative.